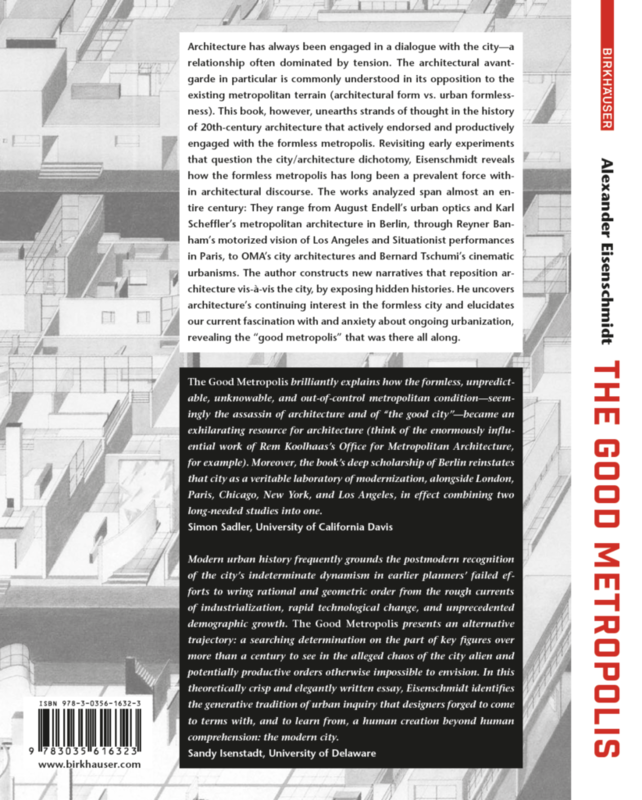 The Good Metropolis: From Urban Formlessness to Metropolitan Architecture (Berlin: Birkhäuser, 2019). Supported by a Graham Foundation Publication Grant and a Getty Foundation Library Research Residency. The subject of this book is the productive tension between the city and architectural form. It seeks to reevaluate the relationship between these two realms in which architecture’s inherent predisposition toward form is often matched only by the city’s ability to avoid it. While design is defined by intention and deliberation, the urban environment frequently appears aimless and conflicted, even accidental, fostering a tendency to view urbanization as undermining and negating architecture’s effectiveness. This book, however, traces an alternative discourse of architecture’s relationship to the city. 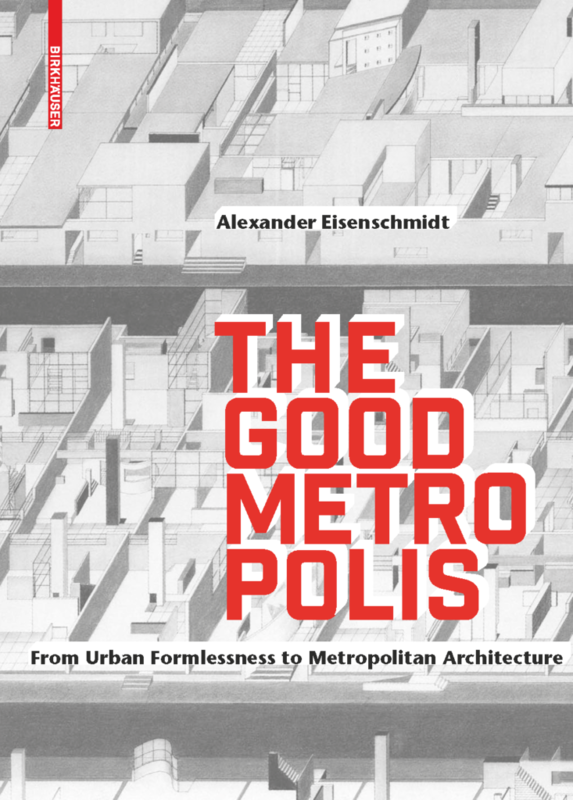 As the title “The Good Metropolis” suggests, I explore here the fascinations with the modern city expressed by the architectural avant-garde and beyond, revealing how the forces of urbanization often served as a stimulant for architecture’s spatial imagination. It considers so-far overlooked courses of action within architectural modernism and twentieth-century urban theory that are not predicated on tectonic functionalism, technological inventions or such like but instead on architecture’s intimate relationship with the metropolis. I argue that the city has been a predominant force (even if often unconsciously) within architectural discourse and that recognizing it as such will not only allow us to reconsider historical narratives but will also give us a better understanding of our current fascinations and anxieties in regards to urbanization. This book unearths strands of thought in the history of 20th-century architecture that actively endorsed and productively engaged with the formless metropolis. The works analyzed span almost an entire century: They range from August Endell’s urban optics and Karl Scheffler’s metropolitan architecture in Berlin, through Reyner Banham’s motorized vision of Los Angeles and Situationist performances in Paris, to OMA’s city architectures and Bernard Tschumi’s cinematic urbanisms. The aim is to construct new narratives that reposition architecture vis-à-vis the city. By uncovering architecture’s continuing interest in the formless city and elucidating our current fascination with and anxiety about ongoing urbanization, the book aims to reveal the “good metropolis” that was there all along. … now available in stores and online. Stay tuned for book launches, readings, and lectures on the topic.